Hope's Cafe: Nature Valley Review and Giveaway! "Since the dedication of Yellowstone as the world´s first national park in 1872, America´s parks have been visited by hundreds of millions of people who marveled at their beauty, found peace in their wildness and shared their experience with others." Thanks to MyBlogSpark and Nature Valley, I was sent me a generous pack of goodies, in conjunction with Nature Valley's National Parks Project. This pack contained a mini backpack, military-grade compass, solar-powered keychain flashlight; reusable water bottle, a copy of "1,000 Places To See Before You Die: A Traveler's Life List", and, you guessed it-a box of Nature Valley Granola Bars! You see, right now Nature Valley is supporting the National Parks Project, so, for each granola bar wrapper you send back, they donate .10 cents to the Project! This year the National Parks Project is focusing on restorative work at Grand Canyon, Yellowstone, and Biscayne National Parks. I have had a lot of fun using the items from my pack. I use the mini backpack all the time to bring snacks or books when we take a car trip. It's an easy way to keep everything together, and it keeps the books safe and clean. I drink a lot of water, so of course the reusable water bottle has come in very handy as well. I fill it with cold water, and then use it throughout the day. The book "1,000 Places To See Before You Die" was a great book to include in the pack. I have really enjoyed reading through this and getting ideas for places to visit! (Some of the family didn't enjoy all the trips I was planning, though...) Seriously, this book has great information about some really neat places. We did like going through and marking off all of the sites we have visited already...the Alamo, Gettysburg, the Museum of Science and Industry, and of course, one of my personal favorites, Arches National Park near Moab, UT. That is definitely a place you want to visit! The flashlight was useful for the night we lost electricity recently. We had candles lit in the living room, but it was nice to have this cute little flashlight to use when I had to go into another room. And of course, the Nature Valley granola bars. I love these granola bars! I used these for a quick breakfast several times! My favorites are the Peanut Butter and Oats n' Honey varieties. 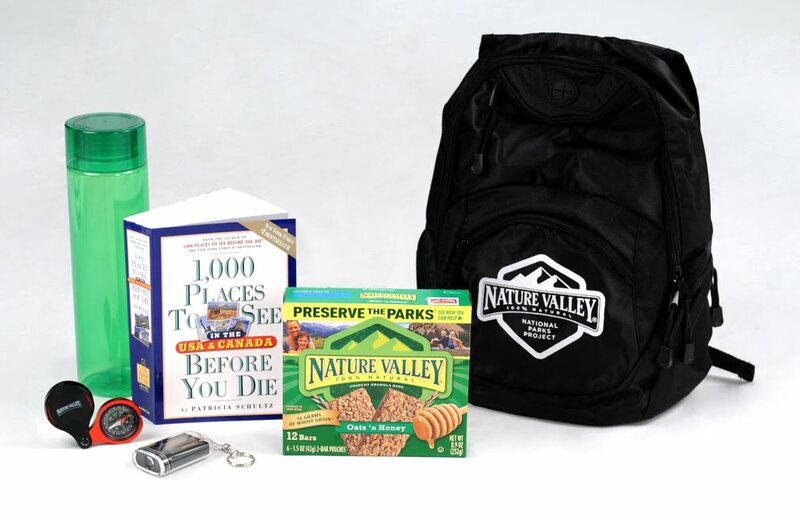 Now, thanks to MyBlogSpark and Nature Valley, one of you will receive the same Prize Pack I received! Tell me which National Park you would like to visit most, and WHY! This giveaway ends Thursday, Sept. 9, 2010 at 11:59 p.m. Please leave a valid email address in each comment, as this is how the winner will be notified. Winner will have 48 hours to respond, or another winner will be chosen. Giveaway open to US residents only. Disclaimer:Thank you to MyBlogSpark and Nature Valley for allowing me to review and giveaway this prize pack. The products, prize pack, information and additional prize pack to give away were all given to me from Nature Valley through MyBlogSpark. I would love to visit the Great Smoky Mountain National Park in Tennessee. We are actually taking a road trip with friends there next month! I entered the Gold Canyon Gift Basket Giveaway. I would like to go to Dry Tortugas National Park in Key West, FL. The reason is because I have lived in Florida for 1/2 my life and never been to Key West. I think I would like to go to Gettysburg to show my British husband as he would be real interested to see this. I've always wanted to visit Yellowstone National Park. I am a follower 2. The famous Yellow Stone National Park, we dont take family vacation but i love nature. I love to explore and learn about where we live and where we come from.